The company says the entry-level TVs are a one-off effort and it has no plans to ditch WebOS. 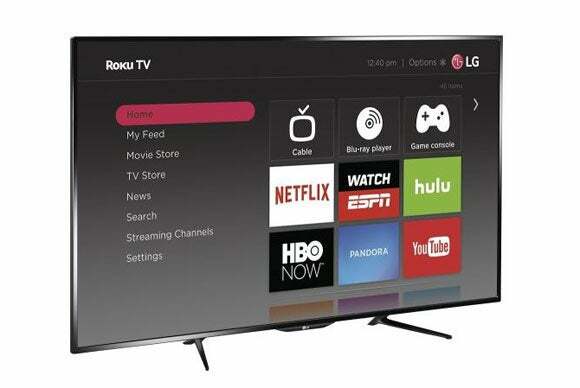 In a surprising move, South Korean consumer electronics giant LG is now offering new entry-level TV models that are powered by Roku’s smart-TV platform instead of its own WebOS software. It quietly began selling these sets through Best Buy a few days back. The new range includes two models: the 55-inch 55LF5700 and the 65-inch 65LF5700. The difference in size aside, they are essentially identical in terms of specs. Both pack a 1080p LED-backlit LCD panel with a 60Hz refresh rate, Wi-Fi, three HDMI ports, and one USB input. The only other area where they differ from each other is price: While the 55-incher sports a $550 price tag, its larger sibling is priced at $1,000. As for the software, anyone who has any prior experience of using a Roku media streamer or streaming stick will feel right at home as they all share the same interface. And in case you haven’t used a Roku device before, fret not for there’s no learning curve to speak of and it shouldn’t take you long to adapt to the remarkably simple interface. Don’t hold out much hope for a Roku-powered LG OLED TV, though. LG has made it clear that it has no intention of ditching its WebOS smart-TV platform, and that this is just a harmless dalliance: “As part of a limited-time promotion with Best Buy, LG is offering one entry-level series of TV with non-LG Smart TV technology this holiday season. While the Roku platform was chosen for this brief, cost-competitive promotion, LG’s own webOS platform remains at the core of our extensive Smart TV lineup,” the company told CNET in a statement Monday, as if almost embarrassed by its partnership with Roku. The impact on you at home: A one-time thing or not, this is a great opportunity for anyone who’s ever been interested in the Roku TV platform but is far too brand conscious to go with one of the existing options from the likes of Haier, Hisense, TCL, Sharp and Insignia (Best Buy’s house brand). LG is arguably the biggest name to sell TVs with Roku-supplied brains.